How are we to interpret Jacques Derrida's writings now, after so much commentary has been devoted to his thought and his own astonishing productivity has come to an end? 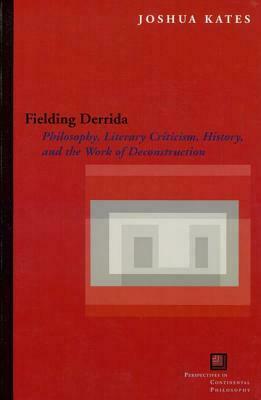 In this groundbreaking book, Joshua Kates extends his earlier contextualizing of Derrida's work in relation to Husserl by arguing that we must begin from a frame different from that provided by Derrida himself. His work must be inserted into already existing fields, thus "fielding Derrida." By placing Derrida's texts in the context of broader fields (such as interpretations of modernity and analytic philosophy of language), Kates captures Derrida's stances with a new concreteness and an unprecedented scope, forging links to vital debates across the humanities today.